Is meal planning something you always mean to do…but it just does happen? Imagine having your family's meals all planned out for each night of the week. You're feeling confident and relaxed because you know you have all the ingredients you need on hand, yummy and ready to go. It's not just a dream. I promise YOU can make it a reality! 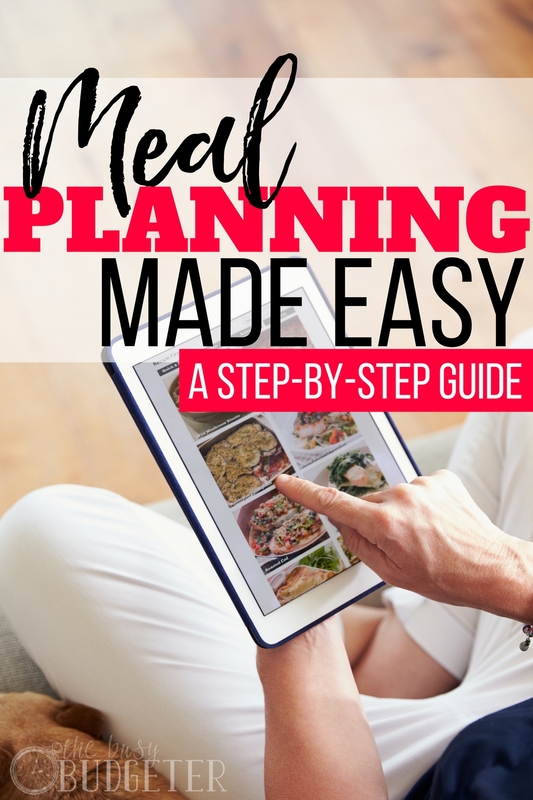 If just the thought of “meal planning made easy” sounds like a cruel joke or induces a panic attack—it's OK! No need to freak out! You, too, can cook up easy dinners that are cheap and healthy, and won’t stress you out. Even if you hate to cook, your family members have seven different allergies and are super-picky, OR if you just don’t know where to start, there's still a free meal plan that can work for YOU! 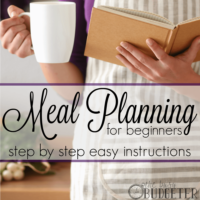 If the very suggestion of a meal plan is scary or overwhelming, I want you to visit my meal planning basics post to help calm your fears and help you get an idea of what meal planning looks like. Why do you need a meal plan? 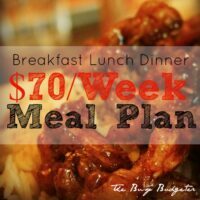 Because meal planning on a budget offers the highest potential to reduce your monthly expenses! Food bills are both the easiest and the hardest area of your budget to reduce. It requires preparation and learning some life skills you might not feel equipped for, but there's totally room to make mistakes. You might try to go gung-ho with meal planning, spending hundreds of dollars on groceries, only to have it all go bad in the fridge, while you spend just as much going out to eat. You might buy things your kids hate. You might plan meals that don’t turn out, take a long time, or just generally make you feel like a hot mess. It’s okay. If you follow these basic meal planning steps and find a type of meal plan that works for you, you can mitigate all of that disaster right off the bat! You can find a realistic meal plan that works for you and your family. You can even find a diet-friendly meal plan that will help you lose weight, or a meal plan to help you deal with your family’s preferences and allergies, and definitely a meal plan that will save you money and time. It just requires a little bit of self-examination and getting a handle on what’s out there. Grab a meal planning worksheet with the days of the week on it. I’ve made a free meal planning printable here. Examine your schedule/calendar: Do you have any events? Social plans? Is there a busy night or do you work late? Mark the days that meals will be difficult with a small “X” in the corner. Don’t worry about breakfasts and lunches yet. You’re going to address them once you get used to planning dinners. Sure, you can write down 2 or 3 simple, crowd-pleasing options for breakfast and lunch (bagels or cereal for breakfast, leftovers or sandwiches for lunch)—but for now, plan mostly for dinners. Choose easy, familiar dinners—meals you can make, that your family likes. Even if it’s macaroni and cheese, frozen pizza or soup from a can—totally fine. On a new list, write down the ingredients you'd need to buy to create those meals. Make sure meals with fresh ingredients are slotted for early in the week. Next, take your ingredient list and check it against your fridge and pantry. Cross off items you have on hand. Use your list to grocery shop. Success! You've just meal-planned! GO YOU! Best for: Busy people with busy weeks! If you look at your calendar and think there’s no way you can avoid the fast-food line this week, try these types of meals. 15 minute meals are often convenient foods—prepackaged, ready-made, instant solutions. Even though they might not be “Instagram-worthy,” they’re cheaper and less fattening than fast food, yet quick and easy. If you’re really crunched for time, most of these meals can be eaten off paper towels or paper plates, so you won't amass a sink full of dishes. They don’t require skills, preparation, or cooking experience. They also don’t require a bunch of pre-planning. These quick meals should be made from “default ingredients” you can just keep on hand or store in your freezer/pantry/fridge. Examples: Pepperoni Pizza Bagels, Chicken Parmesan Pasta, Broiler Steaks and Greek Salad. Best for: People who are home throughout the day, but don’t have time to spend in the kitchen. Crock pots, slow cookers, whatever you want to call them—they cook meals low and slow over the course of the day. Usually meals take 6-10 hours to cook, but most require very little prep time, so you end up with a flavorful, satisfying meal that feels “special” and comforting. These meals can be enjoyed on their own or they can be paired with a simple side like a salad, garlic bread or fruit. You can check out my Slow Cooker Lazy Dinners Pinterest Board for my favorite slow cooker meals. Examples: BBQ Pulled Pork Sandwiches, Chili, Broccoli Cheddar Soup, Salisbury Steak, Beef Stew, Cranberry Chicken. Best for: People who have free time on the weekends and enjoy cooking, but have busy weekdays. Freezer cooking is one of my favorite meal-planning methods! You can freezer cook really healthy dinners and feel great about what you’re feeding your family, while still saving time and money. You literally mass produce your entire week’s worth of meals all at once, so the rest of your week is free from cooking. It’s easy and fun! Plus, you only have to clean up once…and who doesn't love THAT?! Examples: BBQ Beef Cups, Quesadillas, Hamburgers, Tater Tot Casserole, Chicken and Broccoli Casserole. HINT: We use this system now for both freezer cooking and the freezer dump cooking below because it’s cheaper and makes planning meals and prepping quick and crazy-easy. 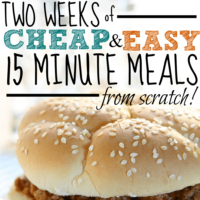 You can seriously make 10 meals in an hour! Get MyFreezEasy here. Best for: Those who enjoy effortless meals during the week, and who have a little prep time on weekends. Comfort-food lovers! Dump cooking has a funny name, but it comes from the idea that you literally “dump” the ingredients in your slow cooker and enjoy! Often the ingredients are easy to combine and don’t require tons of prep. You bag them up and freeze them in gallon Ziploc bags, and then when you’re ready, you thaw them overnight and dump them in the slow cooker in the morning. By dinnertime, you have a yummy meal that’s hot and ready to enjoy! If you use FreezEasy, you can get pre-prepared meal packs ready-made, which ramps up the convenience factor. Even if you prep your own, you can have 20 meals ready to go in less than two hours! TWENTY. Examples: Beef and Broccoli, Beef Stroganoff, Orange Pork Chops. Best for: Those who like shopping or getting creative and finding inspiration from what you buy and have on hand! If you find a great deal on meat or a special ingredient at the store (or if you happen to have a bunch of something on hand), let it be your guide and plan your meals around the items you have! Sometimes we buy meat in large quantities on sale or we find a great bargain on something. When this happens, I plan my meals around that ingredient, and just buy extras and sides to stretch our meals all week long. This might mean thinking on your feet when it comes to ideas for sides, and it also requires you know what to do with the ingredient as well as have an idea of what you already have on hand. This method can be a bit more challenging, because it requires some cooking skills and knowledge (like how to cut up a whole chicken or what to do with cube steak or venison), but it can save you a lot of money. Examples: Homemade Bread, Muffins, Chicken Noodle Soup, Grilled Meats. Best for: Realists who know that life happens so it’s better to budget appropriately. Guess what? Eating out isn't ALL bad. If you plan ahead and don’t just go impulsively or mindlessly, and if you make good choices, eating out can be a real timesaver. Just understand that if you choose to eat out, it means you have to sacrifice in other areas to maintain your budget. Across the bar, it almost always costs more to eat out, plus, if you’re watching your weight, it can be tougher to find low-calorie options. If you budget for a lunch or dinner out a few times a week, plan ahead. It’s usually not the main meal that costs money (like a burger, sub or taco) but the sides, the drinks, and the whole experience. So if you plan to supplement your meals with occasional fast food and takeout, bring your own drinks and sides, and budget appropriately. List the prep and cook times on your meal plan. This saves you from expecting to come home to a quick meal option, only to realize you forgot to put Tuesday’s dinner in the slow cooker…so you ditch your plan and go out to eat anyway. I know, sides can be kind of fun, but they can also be overwhelming. If you’re new to meal planning, stick with easy go-to sides: a salad, a baked potato, veggies, or fruit. So you forgot to put your ingredients in the crock pot. Or you didn’t thaw the chicken for your 15 minute dinner. Or your day just didn’t go as planned. Crud. Pantry meals are options you can go to when all else fails. This might be a can of soup and grilled cheese, peanut butter and jelly, pasta with Italian dressing, or another simple meal you can make in just a few minutes. Establishing a backup meal plan can go a long way to tightening up your food budget overall. Remember: with just a little bit of planning, you can cook up some easy meals to satisfy your family. You don’t have to have big fancy gourmet meals every night—opt for the foods your family loves and enjoys. If you like burgers, keep buns and pre-made patties on hand. If you love sloppy Joes, set Tuesday night as Sloppy Joe Night every week. 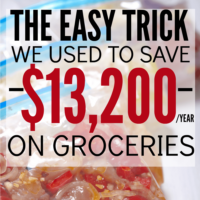 Find what works for you and you’ll be able to enjoy regular, cheap and easy meals and keep your budget on track! Meal planning is one of those things I’ve always had the best intentions with, but something I still struggle to stick with. I always seem to be too busy to sit down and find some meals to cook, so I always end up cooking the same things or letting food go to waste. I am going to make it my goal this month to check out and plan some 15 minute meals and slow cooker meals from your list, and try to make the system stick this time! Rosemarie, thanks for tips! I read your earlier post about meal planning and tried it. And noticed expenses for the groceries dropped down and fridge is not filled with food bought on a whim anymore. Very valuable for my budget! Thanks for these tips Rosemarie! Meal planning and I have a love-hate relationship. For a long time, we used a minimalist meal plan – for about 3 months we basically ate the same meals every week. It worked until my husband screamed for variety. Now, Im meal planning ago. Yuck! But pinterest is certainly helping with ideas. I’m kind of all over the place with meal planning. There are some weeks that I do really well, and some that I totally avoid it. I used to meal prep all of my meals, but found that I actually enjoyed the process of making my own food at that very moment. I am so inspired by all aspects of your blog! I love the look and feel of it, so sleek. I am obsessed with meal planning and this was a great read. Looking forward to checking out the rest of your site and getting inspired. Really easy meal planning. Thanks for sharing!